This page last rendered on local time. Page layout optimized for Firefox and Chrome browsers. To see this chart better, simply click on it, and the chart will open full-size in a new tab. This plot shows the major parameters of the interplanetary magnetic field as well as the current solar wind, over a period of the last one to two hours. There are five graphs on this plot, the first two of which deal with the interplanetary magnetic field, and the remaining three the solar wind. The first plot has two lines. The white line is the Bt component, which is really just nothing more than an index of the total strength of the interplanetary magnetic field. The red line is the Bz component, which is simply the direction in relation to the Earth's geomagnetic field, with the center dashed line being the zero point. The higher above the dashed line the red line is, the more strongly the field is aligned with Earth's own geomagnetic field. This condition favors stable propagation characteristics, though not necessarily good or bad. When the Bz is strongly negative, propagation can get quite unstable and blackouts are possible. But this doesn't always happen - if the Bt (strength) is low, the Bz (direction) will have little effect. When the Bt is elevated, the Bz has a greater effect, so it's best to think of the effect of these two parameters as being the product of the two of them. Another effect of a sudden shift of Bz concurrent with a high level of Bt is that noise bursts can occur when there is also a high solar wind electron count - this effect is most pronounced at 6 meters. The second plot is the interplanetary magnetic field "phi" parameter. This is the current orientation of the interplanetary magnetic field in the same plane as the Earth's orbit, with the orientation specified as relative to a line drawn from the center of the earth through the center of the sun. Ordinarily, this parameter has little effect on propagation, but it can have when both Bz and Bt are both changing rapidly. It's a further disturbance that can upset the geomagnetic field and cause a dump of interplanetary electrons into the ionosphere, causing a short term rise in background noise on HF and 6 meters. The center plot with the orange line is the current particle density of the solar wind. This is measured in terms of the number of particles per cubic centimeter of interplanetary space in the vicinity of Earth. There are a variety of particles, but this one only measures protons and positively-charged ions. When this number is high, protons get dumped into the ionosphere at the Earth's geomagnetic poles, causing auroras and a high "polar cap absorption factor" in the D-layer. This can cause distortion on radio signals passing through the polar regions, giving the signal a distinctive "watery" sound. When sufficiently intense, the signal levels may be attenuated a good deal and the distortion become so severe that SSB signals become unintelligible, and CW takes on a characteristic noisy buzz. The nest plot down, with the yellow line, is the solar wind speed. This is the speed of protons and ions streaming out from the sun - electron speed is measured separately and is not included in this data. The higher the speed, the greater the effects of disturbances in the flow of the wind will be on the ionosphere. When speeds get high enough, as they occasionally do, the F2 ionization layer is literally blown away, and radio propagation dependent on the F2 layer will be blacked out. The bottom plot, with the green line, is the temperature of the solar wind protons. This affects how they interact with the ionosphere - when it is high, the protons have more of an effect on "blowing away" the F2 ionization on the sunlit side of Earth. When it is low, the protons are more likely to get trapped in the field lines of the Earth's magnetic field, causing a "proton event" - which causes auroras. with their effects as described above. 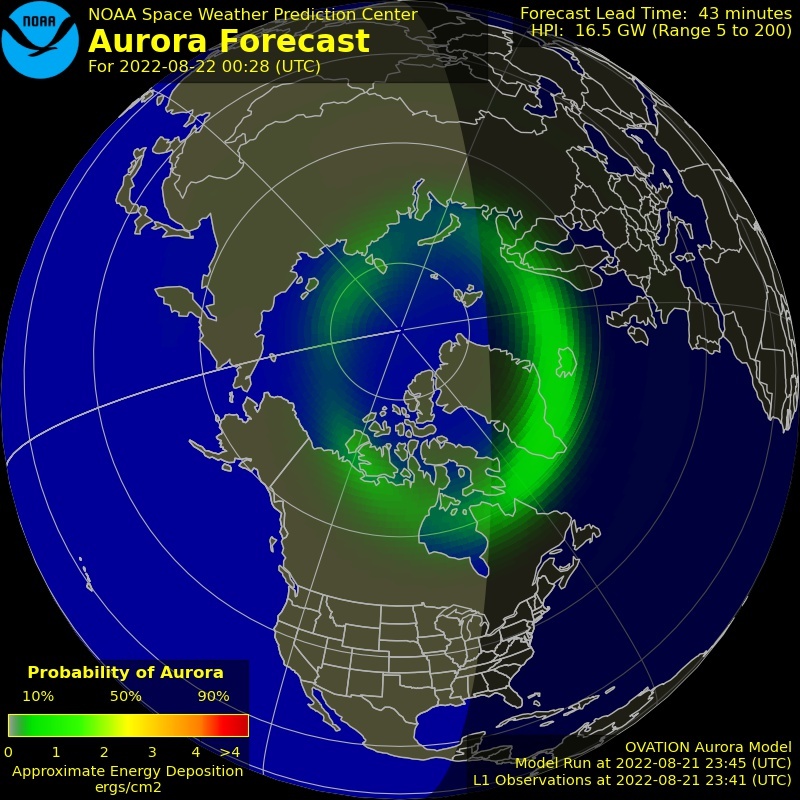 The auroral map, courtesy the NOAA Space Weather Prediction Center using its new OVATION model, shows the area that is predicted to be affected by auroral ionization for the time indicated at the bottom right of the image. To see the map full size, right click on the image and select "view image" from the pop-up menu. The brighter the green color, or when it goes yellow or even red, the more intense the ionization. Signals that travel through this region are subjected to phase distortion and very rapid selective fading, often giving a single-sideband signal a characteristic "watery" sound. As ionization becomes more intense, particularly after a coronal mass ejection, auroral curtains ("northern lights") can occur and radio signals can be literally bounced off the visible auroral curtains, though the effects noted above can become extreme, making SSB signals unintelligible, PSK signals become very error-prone, and giving CW signals their own modulation, a characteristic buzzing sound. The visible aurora borealis should be visible at any point north of the fine red line seen on the map - which means any point north of that line should have 6-meter propagation to many another points north of it, by bouncing the signal off of the auroral curtains. These maps are generated by calculation, rather than actual measurement, because the polar auroral data is rather sparse, being measured only every 90 minutes by the POES satellite, which does not always pass through the auroral region due to the nature of its orbit. For that reason, these maps are mostly good guestimates. To view map and read legends, right click on the map and select View Image. It will then be presented on your browser in full size. To return, click your browser's "back" button. This map, courtesy NOAA's Space Weather Prediction Center, shows the current D-layer absorption anomaly, worldwide - how much more D-layer absorption is occurring than normal. Colored areas on the map show the absorption that will occur on a signal passing through the ionosphere at that spot, the redder the color, the more the absorption. The chart on the right indicates the absorption anomaly for any given frequency at the worst spot shown on the map. It is important to remember, when using this map, to understand that it is only the current anomaly - how much the current absorption level departs from normal background levels - in other words, how much worse it is than normal. A yellow or red area in the tropical blue spot indicates that a solar flare is likely occurring, which may be disrupting communications. If you click on the image, it will open a new page that will monitor the conditions in real time, and also provide charts that are relevant to each 5Mhz. portion of the HF spectrum. It is important to understand that the attenuation anomalies shown on this map are actually for only one trip through the D-layer, and the path taken on that one trip is assumed to be vertical. So actual attenuation will be more than the indicated value; at minimum, twice the indicated value if the path is vertical (straight up and then back down again), and much more than that if the take-off angle is near horizontal (because the signal spends much, much more time getting absorbed while passing through the D-layer to get to the E or F2 layer where it is going to be bent back to earth, and then the same coming back down on the far end). For this reason, the indicated attenuation should be considered only an index, not the true value. If you wish, you can calculate the true path attenuation anomaly from this chart (which can be calculated roughly by dividing the indicated attenuation value by the sine of your takeoff angle, and multiplying the result by two). This analysis and 3-day forecast of the geomagnetic field is courtesy the U.S. NOAA's Space Weather Prediction Center. It is more detailed that the SIDC forecast, and is therefore more useful for determining the conditions that are predicted to exist for the three days following the date of issue. The first portion is the analysis of the current state of the geomagnetic field, and the last portion is the forecast; scroll down to section IIB or beyond to get to the forecast. This analysis and forecast often contains a lot of technical terms; here is a glossary that can help you understand such terms as "radio sweeps" and "tenflares." You can view the text in its entirety by right-clicking on the frame, selecting "This Frame" and then "Show This Frame In New Tab" from the pop-up menues. Doing so will present the text in its entirety on a new tab in your browser. Click your browser's "Back" button to return to this page. This map, courtesy spacew.com (Space Weather), shows the currently estimated MUF over paths centered on the points in the contours shown. It is based on currently calculated parameters related to the 10.7cm index and sunspot number. This summary, with much thanks for the hard work of Paul Herrman, N0NBH, at hamqsl.com, contains the basic data you need to know to understand what the bands are doing at the moment and why. The data in it is updated several times per hour. Clicking on the panel will open a new tab with Paul's page, where you can find a wide range of solar data, as well as instructions for putting the panel or others like it in your own page. The most widely watched number, is the SFI, or Solar Flux Index. This is a measure of the intensity of solar radiation at a frequency of 2800 Mhz (a wavelength of 10.7cm). Before the satellite era, it was the only good proxy we had for the 304 angstrom UV radiation, which is not visible, and therefore not measurable, at the earth's survace, so the SFI has been widely watched since it was introduced in the 1950s. Now that satellite observations are available, a far better gauge is the shortwave X-ray flux and the actual 304 angstrom UV flux, which are the actual, direct cause of the ionization (white charts at lower right - see below). Astronomers still watch it, because it is one of the few solar activity datasets we have that has calibrated data stretching back to the 1940s. Background level is 63 - that's as low as it can get at solar miminums, and it can rise into the hundreds at very high solar cycle peaks. To see how the two indices compare, a chart overlaying them can be found here. Scroll all the way to nearly the bottom of the page to see the chart. You will note that the correlation is quite high for the smoothed numbers, but the peaks, particularly at the solar maxima, vary from each other quite significantly. The SN, or Sunspot Number is the oldest and second most widely watched indicator of how well the bands should be doing, but, again, only because it correlates reasonably well with the 304 angstrom UV radiation as well as actual observed propagation conditions on the upper HF bands. The solar flux index, introduced in the 1950s, however, is actually a better gauge of how radio conditions will be, and has been watched since then for that reason. But the 304a index is even better, since it's a direct measure of one of the two principal causes of F2 ionization. The number shown here is the sunspot number quoted by the Space Weather Prediction Center - this, vs. the "calculated" number often seen. This version of the sunspot number takes into account the difference in the radio flux data, and it is the calculated number that is most often seen. A sunspot number of zero is common during or near sunspot minimums, but can rise to the hundreds at the peak of the 11-year cycle. The number does not indicate the actual number of sunspots present; the first digit is the number of sunspot groups, and the second and third (if present) indicate the "effective" number of sunspots - determined, in part, by how much of the sun's visible surface is occupied by sunspots, so this is really an index, not an actual sunspot count. The A and K indexes are measures of the level of instability in the geomagnetic field. That is the earth's magnetic field that shuttles charged particles (protons and electrons) from the solar wind toward the earth's magnetic poles, and air molecules that have been ionized by solar radiation, into the layers of the ionosphere. The primary indicator is the K index, which tells us what the magnetic field is doing currently, and the A index is a measure of how unstable the K index has been, averaged over the last 24 hours. When both are elevated, it means that the geomagnetic field is unstable, and that means signals are prone to sudden fades, and some paths may close while others open up abruptly and with little warning. An elevated K index, in the absence of an elevated A index, indicates a sudden, abrupt disturbance in the geomagnetic field, which can cause an intense but brief disruption in HF propagation. An index number of one or two means the field is stable, greater than five indicates a significant disturbance. The most violent disturbances in the K index are caused by ions in ejected coronal masses passing through the earth's magnetosphere, and causing it to rapidly and violently distort. Watching the trend of the K index can be useful. As the K index increases, E-layer ionization often increases, leading to openings in the VHF bands. Conversely, D-layer absorption also increases, leading to weaker signals on the HF bands, particularly the lower ones. Ionization in the F region usually decreases at mid-latitudes, leading to weaker signals at mid and high latitudes, but often increases in the tropical regions at the same time, leading to better signals across the tropics. So as you see the K index rise significantly, aim your VHF antennas towards the polar regions and your HF antennas towards tropical paths. The X-ray flux indicator of importance is the letter - it indicates the order of magnitude of the X-ray flux as detected at geosynchronous orbit where it is measured. There are five letters, proceeding from weakest "A" levels, rising by order of magnitude each, through B, C, M and X. "A" indicates a low, background level of X-rays at about 1/10 microwatt per square cm. of incident radiation at the top of earth's atmosphere, rising to the most severe at about 1 milliwatt or more per square cm., during the strongest "X" class events. When a flare occurs, the letter in the summary box indicates the order of magnitude, and the number the scalar value within that order of magnitude. The given number will correspond with the graph at the right, where the trend can be seen. Short wave X-ray flux is responsible for some F2 but mostly D-layer ionization, the latter causing higher absorption towards the lower part of the HF spectrum (160m through about 30m). If a flare is severe enough, the D-layer absorption will become so severe that HF propagation can completely disappear for a time. So, in effect, the "solar flux" number and the "X-ray index" are duking it out to affect propagation - the former brings better conditions when the number is higher, and the latter means weaker signals when it is higher, though a modestly elevated level can enhance F2-layer ionization, resulting in improved conditions on the higher bands at the expense of propagation on the lower bands. What to watch for is when the hard X-ray flux (blue line on the graph to the right) is above the "A" magnitude, the D-layer absorption will increase noticeably, as can be seen in the anomaly map in the upper right, exceeding the usual 10 Mhz. limit, and extending into the 14 Mhz. band or beyond, causing a reduction in signal strength on those bands. If this is made up for in a high 304A number - more than about 130 (see below) - the two will cancel out. But if both are weak together or strong together, band conditions will be poor (though the latter increases the chances of an F2 opening on six meters). If both are exceedingly weak, band conditions on 160m. will be improved at night, but otherwise band conditions will be poor. Band conditions tend to be best when the 304a number is up (above 130), and the X-ray flux is down (in the "A" magnitude). The 304A Index is the relative strength of total solar ultraviolet radiation at a wavelength of 304 angstroms, emitted primarily by ionized helium in the sun's photosphere. There are two running indexes available for this parameter, one measured by the new Solar Dynamics Observatory, using the EVE instrument, and the other, using data from the older SOHO satellite, using its SEM instrument. This one is from the SOHO's SEM instrument, and the index number here is roughly equal to the index on the plot to the right, which also comes from SOHO's SEM instrument. While the SDO satellite is more sensitive to change, and is a newer instrument, the older SOHO index is more widely watched simply for historical reasons, and so it is the one used here. The background level - at solar minimums - will typically be around 134, and at solar maxima can exceed 200 or more. It is solar radiation in this frequency band that is directly responsible for about half of all the ionization of the F2 layer, the ionosphere layer of greatest significance to us (the other half is due to solar wind electrons and protons, and the soft X-ray radiation (upper red graph to the right) together in about equal measure. The solar wind electron inflow is how F2 propagation can remain open at night). Watching this number and observing the trend along with the X-ray flux number in the plot to the right will tell you whether the upper frequency band conditions - mostly 30m through 10m - will be improving or degrading over the next few hours. If a time is given, it is the time (in GMT) at which the measurement was made - this index is updated frequently because such things as solar flares and coronal mass ejections can affect the number dramatically over short periods. This is a better index to watch, especially at high sunspot numbers, than the older Solar Flux Index everyone has grown accustomed to watching. That is because the old SFI (which measures solar microwave radiation at 2800 Mhz.) was used for many years to serve as a proxy for this parameter, because in the old days before satellites it was not possible to observe this wavelength directly from the surface of the earth. The problem with watching SFI is that the correlation between it and the 304a radiation falls apart at SFI numbers above about 110. Proton and Electron Fluxes are indexes of the density of charged particles in the solar wind. The higher the numbers, the more the solar wind is affecting the ionosphere. The numbers are a count of the total number of protons or electrons in a cubic centimeter of space, as measured at the GOES satellite at which the measurements are being taken. The effects of proton and electron flux are somewhat complex, depending on a lot of parameters, but in a nutshell it is this: low levels of protons, when the magnetic field is quiet, help "charge up" the ionosphere, improving band conditions, especially on 160m through 40m at night, where these protons are the primary source for ionization of the E-layer (and to a lesser extent, the F2 layer) that supports night-time propagation on those bands. But too many (more than roughly 10 on the chart) can lead to unstable F2-layer band conditions, particularly over the poles, where a "polar cap absorption" event may occur as a result of the earth's magnetic field lines funneling large numbers of solar protons onto the polar regions. Coronal mass ejections will accelerate large numbers of protons well ahead of the coronal mass itself, and these can arrive at earth within hours of the flare's occurence. When this happens, a "polar cap absorption event" will almost surely take place, leading to a "watery" sound in SSB signals propagating via polar paths, particularly those on the sunlit side of the earth, going through the auroral zones. Lower frequency bands, especially 80m. and 40m., will experience higher noise levels, particularly as the coronal mass is passing earth. After the proton event, and the passage of the coronal mass itself (which will cause wildly fluctuating magnetic field numbers and very unstable band conditions), the next wave is the electrons, which may last for many hours up to several days. When the electron flux rises high enough (greater than about 100 on the chart), and the Bz component is strongly negative at the same time, the solar electrons tend to replace protons and other ions in the ionosphere and lead to improved, if rather strange band conditions. Under these conditions, in which the newly-described "F3 layer" is said to be ionized, 10m through 30m can open to the entire sunlit half of the world and remain open for several hours after sunset (with 30m and 20m remaining open throughout the night), and with north-south (transequatorial) paths particularly strong, but at the same time, 40m through 80m will experience weak signals with rapid and deep QSB, and a lot of "frying pan" noise - as much as S6 or more. 6m and 10m transequatorial openings frequently occur under these conditions as a result of the F3 layer ionization. These conditions are often accompanied by polar cap absorption events if the electron flux is high enough. These "electron storms" often follow in the wake of coronal mass ejections, so watch the space weather news for information about recent coronal mass ejections that may cause these unusual conditions several days after the ejection event, and then begin watching for this electron flux number to rise. When it does, start checking the bands for these unusual conditions. You may be the only person on the wide-open band working some rare DX! The Aurora affects paths over the poles, and the higher the frequency the greater the effect, so these numbers are important for stations working DX on paths over polar regions, especially on the higher bands. The first number is an index of the amount of electrical power currently being carried by the north polar auroral curtains, with 1 equalling ten gigawatts, and 10 equalling 100 gigawatts. So the numbers reflect a "decibel-like" logarithmic arrangement - 3 being twice as much current as 1, 6 being four times as much, etc. The stronger the aurora, the more likely a "polar cap absorption" event will be - which causes signals to weaken and have a peculiar "watery" sound to them. The "n= " number is the "normalization" - meaning how much confidence can be given to the main aurora number. The lower the n-number, the higher the confidence - an "n" of greater than 2 means that the numbers should be viewed skeptically. These parameters are measured by the POES satellite, which is in a low-earth, not-quite polar orbit, and so it can measure the numbers only every 90 minutes, and then it does not always pass over the auroral oval; hence the uncertainty. The Bz Component is the strength and polarity of the interplanetary magnetic field, relative to the earth's magnetic field. It is determined by solar activity, and will therefore vary between positive (same direction as the earth's magnetic field), and negative (opposite magnetic polarity) at various times. When it is strongly negative, the earth's magnetic field tends to be cancelled out, at the same time that the field lines are strongly connected to the interplanetary field, which helps solar particles bombard the earth's ionosphere. This is the same parameter seen in the Solar Wind Dials. See "Solar Wind Dials" below for a more complete description. The Solar Wind number is the speed, in kilometers per second, of the charged particles in the solar wind as they blow pass earth. The higher the speed, the greater the pressure is exerted on the ionosphere by the solar wind, and if solar wind pressure is high enough, the ionosphere is "blown away," resulting in fadeouts or blackouts, especially on the higher frequency bands during the day. At night, propagation on the 80 and 60 meter bands may actually be enhanced. This is the same parameter metered in the Solar Wind Dials. See "Solar Wind Dials" below for a more complete discussion. HF Conditions and VHF Conditions are self explanatory. The "EME Deg" simply shows how favorable the current lunar orbit configuration is for EME communications at the moment. Solar Flare probability, calculated by the University of Bradford, in the UK, is the probability of a C-class or greater solar flare occuring at any given time. The MUF bar graph shows the current maximum usable frequency for sporadic E in Europe if that band is open there. The bottom bar graph, labeled MS, shows whether meteor scatter activity is present, and if so, when and how strong it will likely be (redder colors indicating more activity) at any given hour. The Geomag Field indicates how stable the earth's magnetic field is at the moment, the Signal Noise Lvl indicates how much background ionospheric noise is present at the moment, and the MUF Boulder indicates the highest useful frequency that can be used for ionospheric communications paths, as measured measured by NIST at Boulder, Colorado. The 193 angstrom UV image, courtesy NASA/Solar Dynamics Observatory's Atmospheric Imaging Assembly team (top left image), shows the earth-facing side of the sun as it appears in light at a wavelength of 193 angstroms in the extreme ultraviolet. Sunspots appear as bright, almost white areas, and the brighter, larger and more numerous they are, the more radiation there will be in the 304 angstrom wavelength and short (hard) X-rays that are of such importance to us, as it is responsible for more than half of the ionization of the F2 layer, improving band conditions. This image is particularly useful for noting active regions that are weak, and so may not show well in other images. Most important in this wavelength are the large splotchy dark brown or black areas that are occasionally quite prominent. These indicate coronal holes. The darker and larger the area, and the closer to the center of the solar disk in this image, the greater the effect that the coronal hole will have on our propagation. See below for a more complete explanation. The 304 angstrom UV image also courtesy the NASA/Solar Dynamics Observatory's Atmospheric Imaging Assembly team (top right image), shows the solar areas that are contributing most strongly to the total 304 angstrom UV emmissions, which are responsible for about half of all the ionization of the F2 layer. What is important is the brightness of the bright spots, and whether or not they are about to rotate out of view (right hand side of the image). Often, the bright spots on the 191 image might give the impression that the sun is highly active - but their brightness in the 304 image that really matter, and often they are much weaker than would be guessed by looking only at the 191 image. When this occurs, the propagation is not being enhanced by all that activity. It's brightness of the active areas in the 304 image that really counts. Regions that surround the tiny white spots (sunspot regions), that are a bright orange color, are called faculae. These faculae produce a significant portion of the 304 radiation that gives us about half of our F2 layer ionization, so the extent of these faculae are important to us. The HMI Magnetogram image, courtesy the NASA Solar Dynamics Observatory team, shows the magnetic fields associated with active regions on the sun's surface. What is of interest here is the size and intensity of magnetic fields as well as their direction. Black indicates north magnetic pole, and white indicates south. The east-west alignment reverses with each solar cycle, and so it is easy to tell which active region is associated with the last or the next cycle. What is significant about this magnetogram, however, is just how "jumbled up" - how complex - each region is, and its overall size. 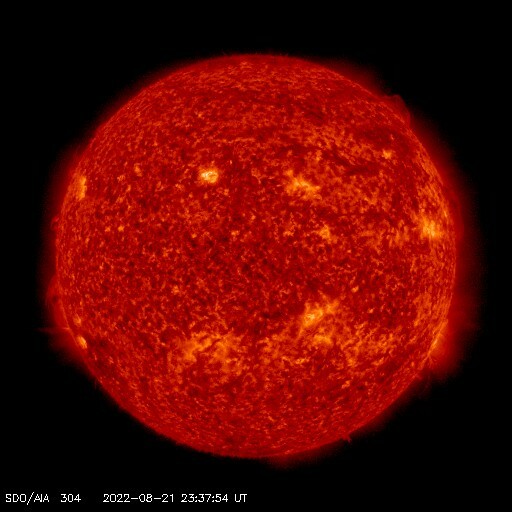 Those that are jumbled up and are quite large are likely to produce larger solar flares. 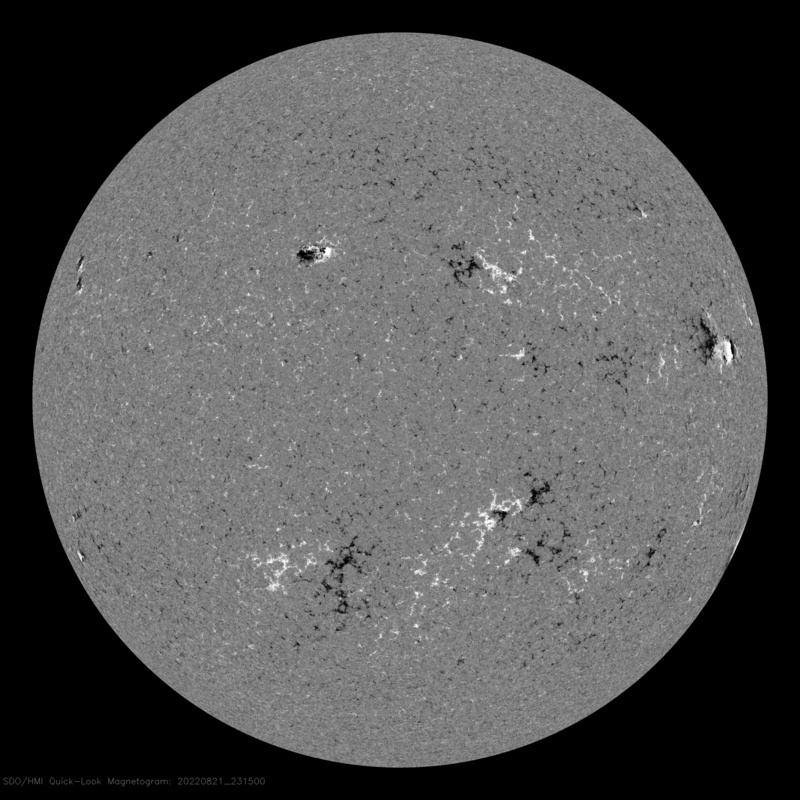 The current STEREO image, center right, courtesy NASA's STEREO project, shows the sunspots that are about to rotate into view. This image, taken from NASA's STEREO Ahead spacecraft which is nearly behind the sun as seen from earth is shot in extreme ultraviolet (195 angstroms) and shows all active regions, including both sunspots and not-yet-erupted-sunspot active regions that are not yet visible from our position on earth (as well as limited visibility of coronal holes). Over a period of days, the features that are prominent on this image will progress from left to right as they rotate towards our view, which begins at about the right-hand edge of this disk. The features along the right-hand edge of this image are visible from earth, and can be observed, from a different perspective, in the left one-third of the disks in the two images above. Watch the right-hand side of this image to learn if there are new sunspots that will soon rotate into view to provide us with improved band conditions in the next week or two, and when they finally appear along the left hand side of the 304 angstrom image at the top, you can ascertain how much effect, if any, they will actually be having on radio propagation. Coronal holes are also visible on this image, in the form of large dark patches. When these rotate into the view from earth, the solar wind speed picks up dramatically, causing proton storms that can cause HF radio blackouts for minutes to hours at a time, with signals coming and going. 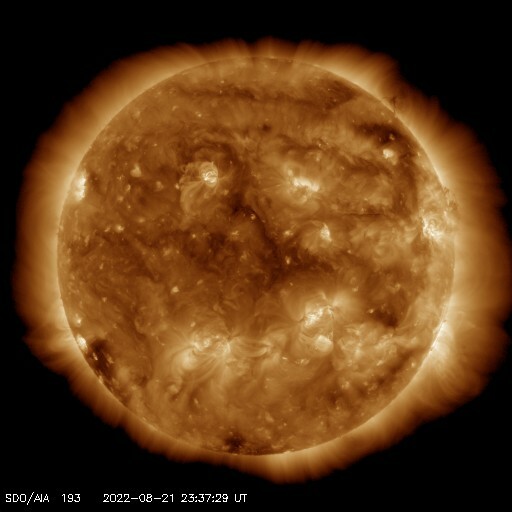 On this view of the sun, a coronal hole in an earth-effective area will appear on the right-hand edge of the image, at about the 3 o'clock position. In the center and to the left, it means a period of HF radio instability will occur when these areas rotate into an earth-effective position over the course of the next few days. This chart, from the NOAA Space Weather Prediction Center, shows the current magnitude of X-ray emissions in real time, showing the magnitude of flares in progress, and those just ended within the last three hours. The magnitude of the flare can be determined from the letters on the right-hand side of the image, as well as the tick-marks, which represent the scalar number in increments of two. For example, an M2 flare will produce a jump in the red line that will extend above the M line, and as high as the first tick mark. Normally, in real time, current location of the red line should correspond to the X-ray number given in the Solar-Terrestrial summary box to the left, though the chart data is normally more current. The red line is of considerable significance to propagation, as it is energy in this band that produces most of the half of F2 ionization not produced by the 304 angstrom ultraviolet. But it is counteracted by high levels of shorter wave energy (which is much more variable) in the shorter wavelengths, indicated by the blue band, which stimulate the ionization of the D-layer below the F2 layer, and absorbing signals passing through it, especially at lower frequencies. During periods of high solar activity, therefore, these two X-ray wavelengths are of considerable importance to hams. If you click on this chart, it will open this chart, full size, in a new tab or window, that will refresh the chart automatically every minute, so the progress of a flare can be monitored in near real time. This plot records the last 48 hours of solar radiation in wavelength bands that are of critical importance to hams, as detected by the Celias/SEM sensor on the SOHO spacecraft, and plotted by the University of Maryland. The usefulness of this plot is principally in noting trends - rising or falling. The upper line, in red, is the most important. It shows the whole-disk radiation from the sun of the ultraviolet radiation in the 304 angstrom wavelength band. Anecdotal observations by hams indicate that the trend on the upper chart seems to predict conditions three to four days ahead, so if the general trend on this chart is trending up, it indicates improving band conditions over the next few days, and conversely, a generally falling trend line indicates band conditions will be deteriorating. The blue line on the lower graph shows the aggregate irradiance level in the entire band of 1-500 angstroms (from X-rays through ultraviolet), and this wavelength band is of considerable importance to hams, as it is also responsible for about half of F2 layer ionization, improving conditions in the upper HF bands (20m.-10m.) but at certain wavelengths, also ionizing the D-layer, raising absorption levels, especially in the lower bands (160m.-30m.). If this line is trending down, but the 304a line is trending up, band conditions should be improving, and vice versa. Jagged upward jumps indicate radiation from flares, and an upward jump at the far right end of the graph means that a flare is in progress, and may lead to a blackout on HF due to D-layer absorption caused by a jump in X-ray radiation. That should be evident on the D-layer absorption map, above. High but quiet levels on this chart can mean enhanced band conditions in morning and late afternoon, but with generally poor conditions at high noon on mid-path locations. The Current Coronal Mass Ejection (CME) Forecast, courtesy NASA's Goddard Space Flight Center, shows whether the latest coronal mass ejections will actually impact earth. The small, condensed graphic is hard to read, but if you click on it, it will open up full-sized in a new tab in your browser. The image is an animation, showing the progress through space of coronal mass ejections for a ten day period, beginning from when the model is run (indicated in the upper right). Each image in the animation represents a six hour interval in the sequence. It is important to note that this forecast model is only generated whenever a C-class or greater flare occurs and it may remain unchanged for long periods. So you need to check the date and time of the model run in the upper right to know if it is current. Coronal mass ejections are important, because when they impact earth, they cause wild fluctuations in the earth's magnetic field, which can cause a blackout of radio propagation while these fluctuations are happening. They also charge the upper ionosphere with additional ions, which can support propagation of six meter signals on occasion. They cause auroral displays, which, for hams in high enough latitudes, can support six meter propagation by bouncing signals off of the auroral curtains. It is the coronal mass ejection that, if strong enough, can wreak havoc on earth by causing fluctuating magnetic fields that induce voltage into long power lines and telephone lines, resulting in power blackouts and damage to power distribution equipment and telephone switches. Widespread service interruptions can be the result. In this image, the circular blue image on the left, with the rotating swirl (called the "Parker spiral"), is the view of the inner solar system as seen from above (looking down on the solar north pole). The swirl is caused by the rotation of the sun, with background ionization in interplanetary space represented by blue, and higher concentration of ions in other colors, progressing through red and pink as the most ion-dense, and traveling outward, away from the sun. Density of the ions (number of actual particles per cubic centimeter) is color-coded, dark blue the least, red, pink and white, through grey being the most, are shown in the legend, which is actually logarithmic, not scalar is might be assumed. In the circle part of the image, CMEs generally appear as an arc of dark blue, with red and even pink out in front, speeding away from the sun (at the center of the spiral) and towards the circumference of the circle. In all three parts of this image, the earth's position is represented by a small yellow-filled circle along the 3 o'clock axis, and for the CME to have any effect on earth, it has to sweep over the earth. CMEs, which sweep out from the sun but don't impact earth, have little, if any effect on radio propagation. In this circle, the earth is located half way between the sun, in the center, and the circumference of the circle on the right hand side. Other icons represent important science satellites, other planets, and occasionally significant comets. The wedge-shaped image in the center shows a wedge-shaped sector of the solar system as seen edge-on, perpendicular to the plane of the sun's rotational equator as seen in the spiral image to its left. The plane of the spiral is therefore the centerline of the wedge. Only those conditions actually lying in the plane that includes earth, are shown. The sun is on the left, at the apex, and the earth is yellow-filled circle in the center of the pie-slice. Above the earth (north) is above the center line, and below the earth (south), is below the center line. CMEs which originate at high solar latitudes tend to miss the earth, because they will pass above or below the earth, and will be seen to do so in this pie-wedge. Regarding the legend at the bottom of the image: the "magnetic sheath" is the point (actually, an undulating plane) at which the interplanetary magnetic field crosses from "Bz positive" (the interplanetary magnetic field is aligned, north-south, with earth's magnetic field) to "Bz negative" (IMF and earth's field are of opposite polarity) or vice versa. When this white line crosses the earth and the IMF polarity changes, propagation instability can occur, and it can become erratic and unreliable, with noise levels rising and signals disappearing within seconds. When the fields strongly oppose (a strongly negative Bz number, as seen in the summary), the earth's magnetic field can get unstable, and propagation along with it. Borders around each image are red or blue, depending on whether the magnetic field polarity is negative at that point (blue) or positive (red). Note that wherever the magnetic sheath line touches the border of the image, it marks the boundary of positive or negative magnetic polarity. The dotted lines denote the solar magnetic field lines that are actually connecting the sun with the object they are being shown to cross; these are of little practical importance to hams. For a CME to impact earth, it has to be seen to be doing so in both the left (circular) and center (pie wedge) images, as well as blasting the earth in the center of the rectangle at right. This image is updated whenever a significant CME occurs, so if you hear in the news of a giant coronal mass ejection, you can check this image to see if it is actually going to impact earth, and get a sense for how significant it will be. Experience with it will teach you how significant a CME impact is going to be as seen on this image. © 2013, Scott Bidstrup, all rights reserved. Todos derechos reservados.